enclosed Himself, made man, within your womb. and your virginity remains inviolate. come to the aid of your servants, O blessed lady. and the Holy Spirit, great glory to God. Amen. 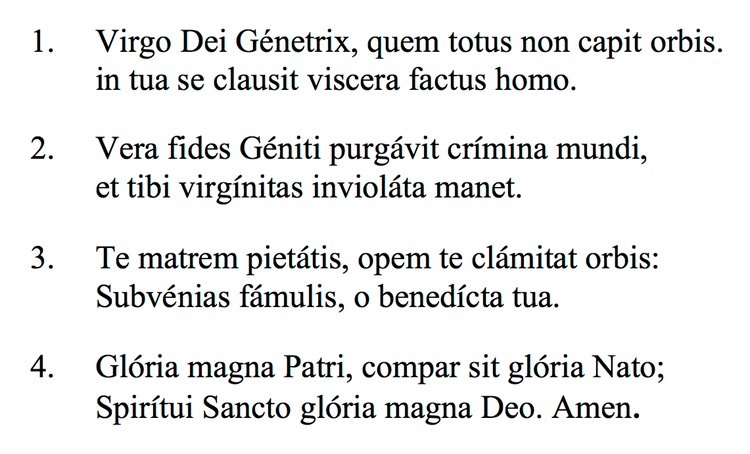 The Latin text is from Liber Hymnarius (Abbaye Saint-Pierre de Solesmes, 1998, page 579) and used with permission from The Abbey Saint-Pierre, Solesmes, France. To obtain the music, please purchase the Liber Hymnarius ( solesmes.com ). Note that the music has been revised and is different from older publications such as the Liber usualis.